HTC, the maker of Google’s Nexus One smartphone, plans to switch the phone’s display from AM-OLED to LCD because of a supply shortage of the component, according to KT, a Korean mobile carrier which plans to sell the device next month here. HTC, a Taiwanese smartphone maker, also looks to replace the AM-OLED displays of the Desire and the Incredible smart phones because of supply issues regarding the parts produced by Samsung Mobile Display, a local report said. “Google Nexus One, which will be produced after July will be equipped with SCLD (Super TFT LCD) and sold worldwide,” KT said in a consumer notice on its website on Wednesday. It said the new display was produced by Sony. KT said the change came as Google and HTC have decided to alter the production standard of Nexus One, but did not elaborate further. Samsung, the world’s No. 2 handset maker, is to blame for the tight supply of AM-OLED displays, analysts said. The Korean company is aggressively pushing for sales of its smartphone Galaxy S equipped with AM-OLED displays, gobbling up the component supply. Samsung Mobile Display, a joint venture of Samsung Electronics and Samsung SDI, controls 98 percent of the global AM-OLED display market. “For Samsung Mobile Display, there may be not enough AM-OLED displays to supply to companies other than its affiliate Samsung Electronics,” Kim Sung-in, an analyst at Kiwoom Securities, said. He expected sales of the Galaxy S to reach around 10-15 million units in the latter half of this year. Samsung Mobile Display has an annual production capacity of 35 million units. “Our AM-OLED display production lines are running at full capacity,” a Samsung Mobile Display spokesperson said. To cope with surging demand, Samsung looks to increase its monthly output capacity by 10-fold to 30 million units (for 3-inch mobile AM-OLED displays) in July 2011 when its so-called 5.5 generation line is completed, with an investment of 2.5 trillion won. Samsung Mobile Display on Tuesday held a ground-breaking ceremony for the new line in Tangjeong, South Chungcheong Province. The display shortage has forced KT to delay the launch of the Nexus One in Korea from late June to the end of July, setting back its bid to keep its smartphone momentum ahead of the iPhone 4 launch in July. 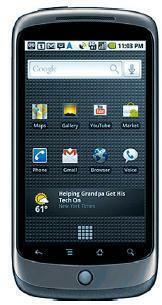 In a preemptive move, its key rival SK Telecom has launched sales of HTC’s Desire, which is called the twin of Nexus One, and plans to introduce the Galaxy S this Friday. SK Telecom is allying with Samsung Electronics, HTC and other handset makers to fight back against KT, which has taken the lead in the local smartphone market with its exclusive sales of the iPhone. The change of the Nexus One display could spark consumer complaints over “downgrading” of the specification of the product. An AM-OLED display -- active matrix organic light emitting diode display -- features a thinner screen with clearer images and consumes less power than its LCD equivalent. In a bid to calm possible consumer woes, KT claimed in the notice that SLCD consumes less power and offers higher resolution than AM-OLED display, although it has a lower contrast ratio. “S-LCD is a new display technology which has merits in power efficiency, web-surfing and text readability,” KT said in the notice. “AMOLED and SLCD are different technological methods which have their respective strengths and weakness,” KT said. HTC CEO Peter Chou did not respond to an e-mail by The Korea Herald on the display change. A spokesperson for HTC Korea was also not available for comment. Meanwhile, Apple’s upcoming 4G iPhone is suffering a shortage of its “Retina display” because of the low yield for the high-resolution display produced by LG Display, an analyst claimed Friday. “Our supply chain checks indicate that our earlier monthly shipment estimate of 4 million units have been reset by about half, according to Ashok Kumar, an analyst at Rodman & Renshaw Inc.
An LG Display spokesperson declined to comment.